Worldwide icon-chevron-right Asia icon-chevron-right Singapore icon-chevron-right Where are the Merlions in Singapore? The Merlion is not a real creature. Not only in the sense that it’s a fictional half-lion, half-fish hybrid, but that it wasn’t a character in local folklore handed down through the years. It was created by a local authority – the Singapore Tourism Board (STB) – in 1964 as a mascot for the city. 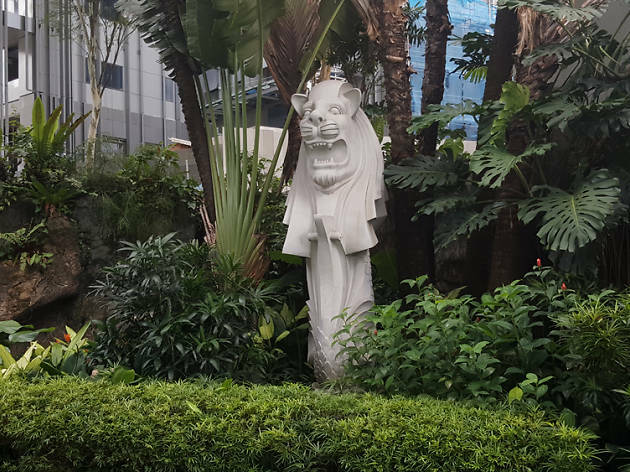 Fraser Brunner, then the curator of the Van Kleef Aquarium, is responsible for the Merlion’s design, whose copyright is owned by the STB. So it should come as no surprise that there are only seven ‘official’ statues of the Merlion around Singapore. Here’s where to find them. 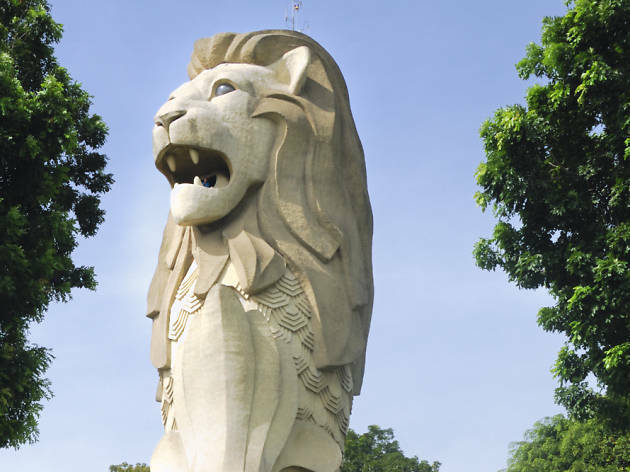 The first official Merlion statue ever erected, standing at 8.6 metres tall, was designed by Kwan Sai Kheong and crafted by sculptor Lim Nang Seng. 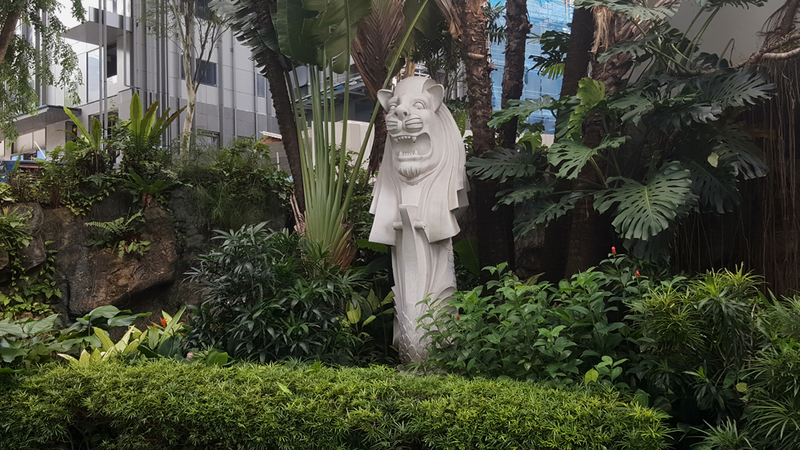 Lim also made a smaller, 2-metre-tall Merlion cub situated behind and facing away from its larger sibling. Both statues are made with cement and inlaid with porcelain plates – and the larger one has red teacups for eyes. 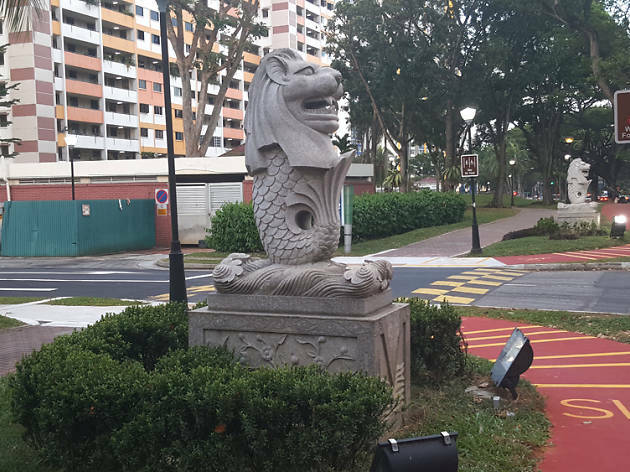 Previously, both sculptures used to hang out at the mouth of the Singapore River. 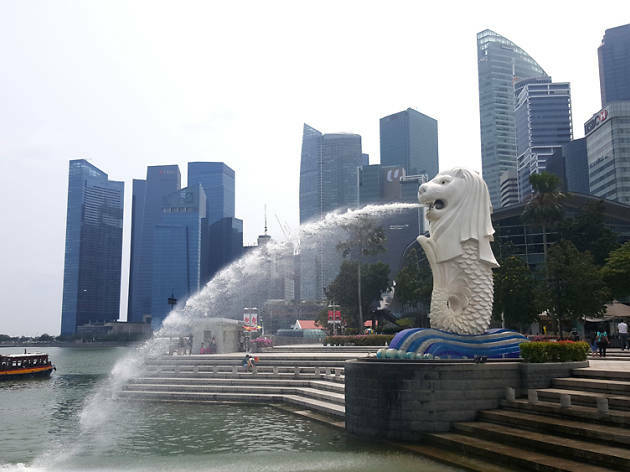 However, with the construction of the Esplanade Bridge, the view of the Merlions from the waterfront was blocked. And so, in 2002, both statues were shifted to their current location in front of Fullerton Hotel, overlooking Marina Bay. 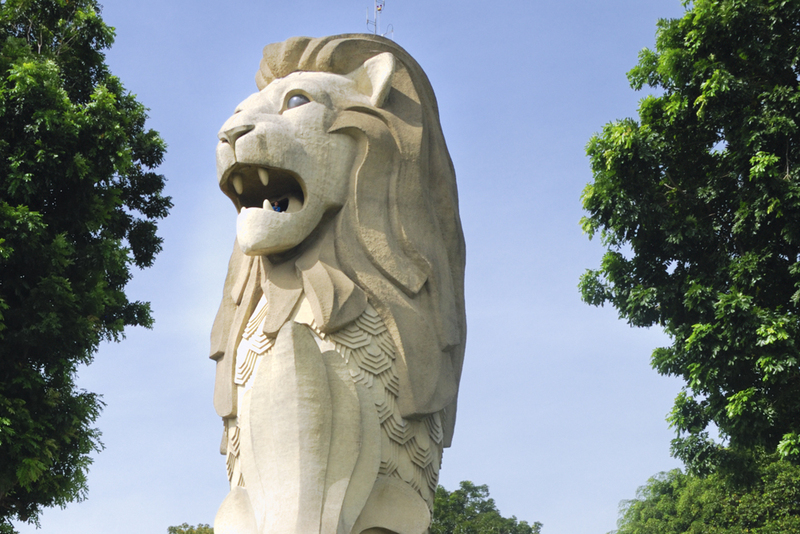 Over Imbiah Station on Sentosa looms the tallest Merlion in Singapore – it’s 37 metres high. Designed and sculpted by Australian artist James Martin, the 320 scales of this cement tower, reinforced with a concrete layer, are moulded into bagua (an eight-sided feng shui motif used to direct ‘energy’). In case that wasn’t enough for the gods of qi, the statue is also built on an octagonal base. Older Singaporeans will remember that this national icon used to shoot lasers out of its eyes as part of the now defunct Magical Sentosa show. 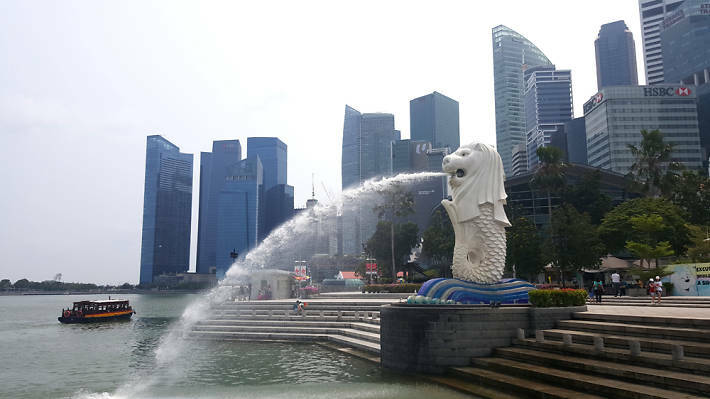 But even with that gone, this Merlion still attracts tourists to its maw, accessible via a lift ($10 per entry), where they can take in panoramic vistas of the island. No, the sculpture inside the STB headquarters in Tanglin doesn’t count. Head instead for the Merlion located at the taxi drop-off point. Made in the Philippines, this 3-metre-tall polymarble statue is also the skinniest (looks slightly weird, we gotta say) of the lot. 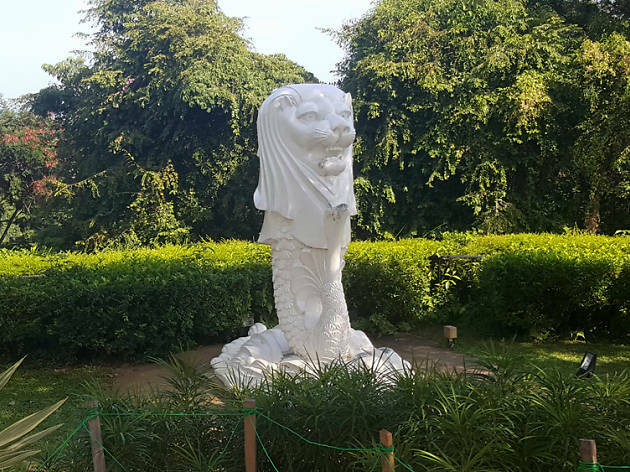 Expect a long queue to take a picture with this 3-metre-tall Merlion – tourists love to plaster themselves over the statue, situated at the highest point on Mount Faber, Faber Point. Made out of polymarble, this sculpture was installed by the National Parks Board as part of the park’s redevelopment. 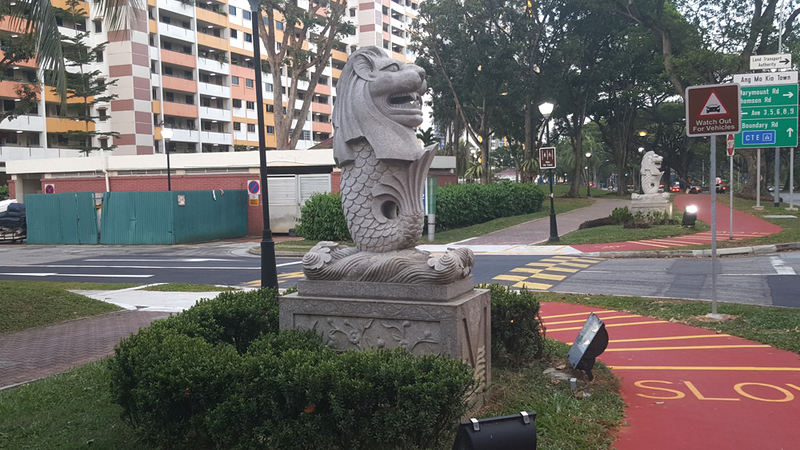 Constructed by the Ang Mo Kio Residential Committee, a pair of Merlions stand guard at the car park entrance of Blocks 216 to 220 at Ang Mo Kio Avenue 1, opposite Bishan Park. Local lore maintains that these sculptures were almost removed – the Residential Committee didn’t get prior approval from STB – but the veracity of that urban legend is beside the point. In a true attestation to our love of bureaucracy, the two Merlions are now well and truly ‘authorised’ by the state. Majulah Singapura!